This month I had the opportunity to work with the gorgeous and very cute Penguins! 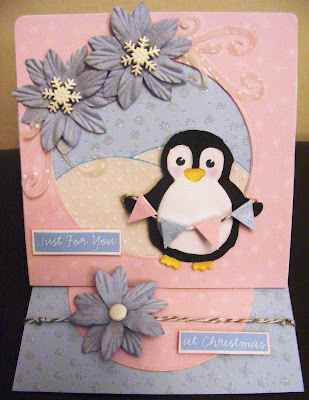 I chose to make a easel card, I added flowers with snowflakes in the middle to give it a festive feel. I am not one for traditional colours at Christmas so I used pink and blue. I have used vellum for the hills as well as some of the decoration. Making the mini bunting is so easy with scraps of paper and some twine. Thanks for popping by I hope to be able to catch up with some blogs soon, its half term here so we are busy out and about. Love your non-traditional christmas card! This wee Penguin is a wee cutie alright Lisa, love the pinks and blues and all your sparkle too..
Oh my word Dazie this is absolutely delightful that Penguin is sooooo cute, the colours and those flowers are amazing, I love this big time. Boy this has got "cute" written all over it. Love the LO, and the colors.